These five little words are difficult to speak. And yet after nearly two years of persistent episodes, hoping and praying for a miracle, I have only recently been able to admit them. Pain. It’s coming has been marked by the calendar when I begin a monthly regimen of medication intended to alleviate the gravity of the onslaught to come. It’s beginning is a long and ominous shadow over the next few weeks, a solemn reminder that the wretched monster still abides deep within me. It’s low bellows vibrate as it slumbers in between events, tossing and turning creating the occasional but manageable discomfort in its near dormant state. Then suddenly and without warning it rises in full fury. Red eyed and fiery tongued, it’s painful scales press, tear and rend me from within. There are days when I feel normal. When I do not live in fearful and anxious anticipation of its awakening. But they are woefully outnumbered by the days I wrestle with the truth of my condition and the current reality of my existence. Sometimes I rant and sputter angry epitaphs and shake my fist at the heavens. Then there are days when I fall into a pit of despair. In the pit is a stagnant pool of isolation where the only current is one of spirit crushing affirmations that darken the mind. Such ongoing resistance handcuffs us to pain and healthy habits as we focus on the negative experience. Though I despair and fear threatens every moment of weakness, you are my strength. Though there seems to be no answers or relief in sight, I know you are the way, the truth, and the light. Because I am brokenhearted and crushed in spirit, and you became flesh to heal and to save me. Because I can let this broken jar of clay dim in soot and ash from the fires of the dragon within OR I can choose joy, choose grace, choose gratitude and let His glory radiate through me. So more often of late than not, when the pain is unrelenting and renders me frail, I set myself at the father’s feet, take my eyes off of my present suffering and fix them on Him. As I recite my five little words, my lifeline in the fray, I’ve come to dwell in the realization that He is my sole source, my everything. All else fades away. And the dragon, though still noticeably present, miraculously quiets. The journey to Joy leads to greater dependence on Christ. I don’t know if one day the dragon will be uprooted and driven from this mountain, though that continues to be my prayer. But in the meantime, I’ve come to believe that this pain has come to give me a gift. Beneath the ashes, beneath the rubble, deep within the lava encrusted exterior there is a treasure to be discovered. Jesus! I trust in you! And so while I wait, I strive to draw closer to Christ and ask why this pain has come and seek what else it has to teach me. As I press closer to know my Savior and abide in the full knowledge of God’s faithful and unfailing love and compassion for me, I have found a growing peace and tranquility that, even in crippling pain, surpasses all understanding. A transcendence otherwise known as joy . Want to read more about finding Joy in difficult circumstances? Then consider Margaret Feinberg’s new book! When Margaret learned she had cancer, she knew she would need great strength to overcome it. She believed the weapon she selected for the battle would change everything. And she decided that weapon would be joy. 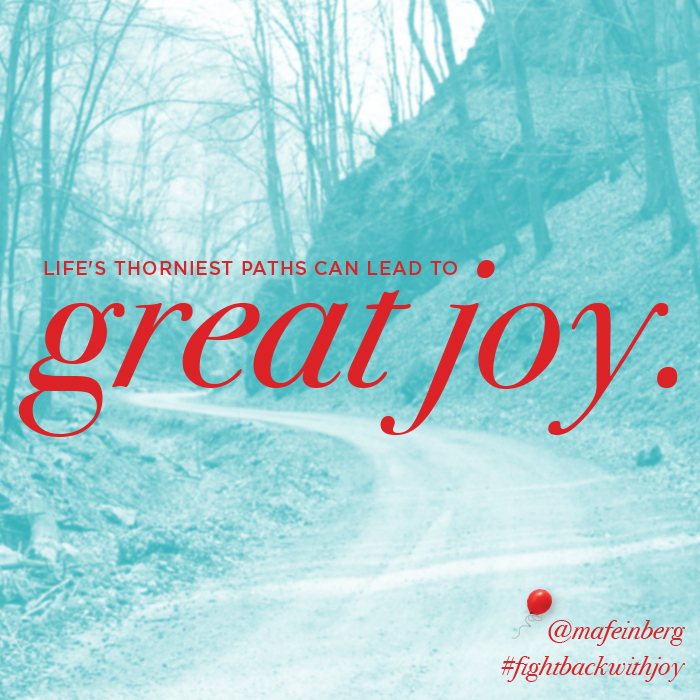 Margaret shares her journey of using joy to fight back fear, regret, and pain. Whatever you face today, discover with Margaret how to embrace a way of living that’s deeper and fuller than you’ve ever known–a life radiant with joy. Love, love, love this Becky. Those are five words I needed to be reminded to live by today. Jesus I trust in you. Amen. Thank you for this.